There’s nothing like a surprise visit from a hometown hero to put a smile on someone’s face. For 13-year-old Deandre Losero, that’s exactly what happened last Friday when he hung out with Cory Jefferson, a forward on Baylor University’s basketball team, after experiencing harsh bullying from classmates earlier in March. Upon hearing about the incident, News Channel 25 reports that Jefferson stopped by to see Losero and give the Killeen, Tex. teen an autographed basketball, Baylor T-shirts and some moral support. “It really does mean a lot, because I never would have guessed in a million years that so many people would be in support of me if something like this happened,” Losero told News Channel 25. When he was was walking home from school on March 7, Losero — who has autism and ADHD — was beaten up and called a series of racial slurs by a 16-year-old student. The attack was recorded on camera, and led to Losero having a broken wrist. Jefferson’s act of kindness comes one month after another uplifting story demonstrated how a little bit goes a long way when it comes to bullied teens. In January, seventh grader Noah Brocklebank posted a photo to Instagram that revealed his plans to end his own life on his 13th birthday because of incessant bullying. Noah’s mom, Karen, created the website “Letters for Noah” and asked strangers to write encouraging notes to her son. The Baltimore Sun reported that by the time his birthday came in February, Noah had received 2,000 letters. Have you heard of any other uplifting stories about teens recovering from being bullied? Tell us in the comments or tweet at @HuffPostTeen. 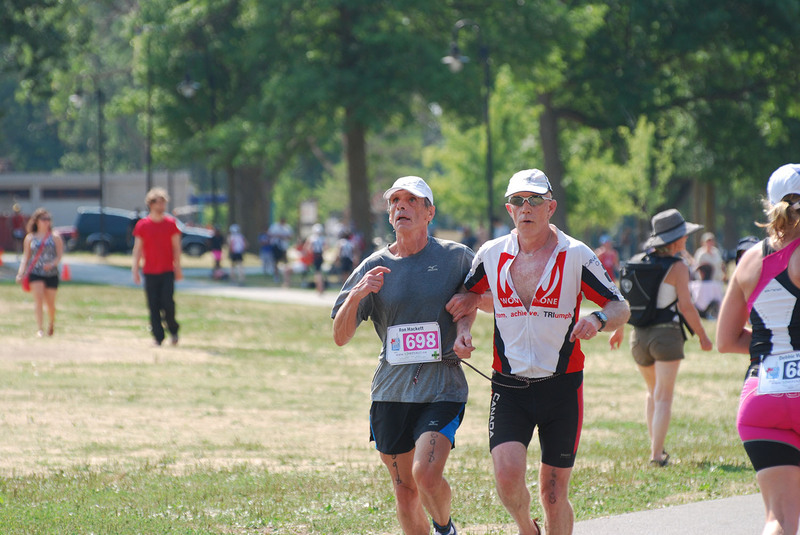 Ron Hackett and Tim Scapillato running in the Ottawa Duathlon in 2012. In 1985, I was a 30-year-old non-runner who smoked a pack of cigarettes every day. Today, I’m running the Boston Marathon along side one of the most inspirational men I’ve ever known. I quit smoking all those years ago because my wife and I were starting a family. Like I had done so many times before, I made a New Year’s Resolution and butted out my last cigarette at midnight. To keep my hands busy, I took up knitting – yes, knitting – but six feet into my first scarf, I knew it wasn’t going to be enough to take my mind off my cravings. I needed something more satisfying. So I put the knitting needles down and went out for a run, and then another, and another. I had found my new addiction. It took me four years to work up to my first marathon, but when I crossed the finish line of that race in Ottawa, I knew this sport had me, mind, body and soul. If you’re a runner, you know that the feeling of completing a long run is unlike any other. There’s something about the calm and steadiness of it all that makes me feel fantastic. 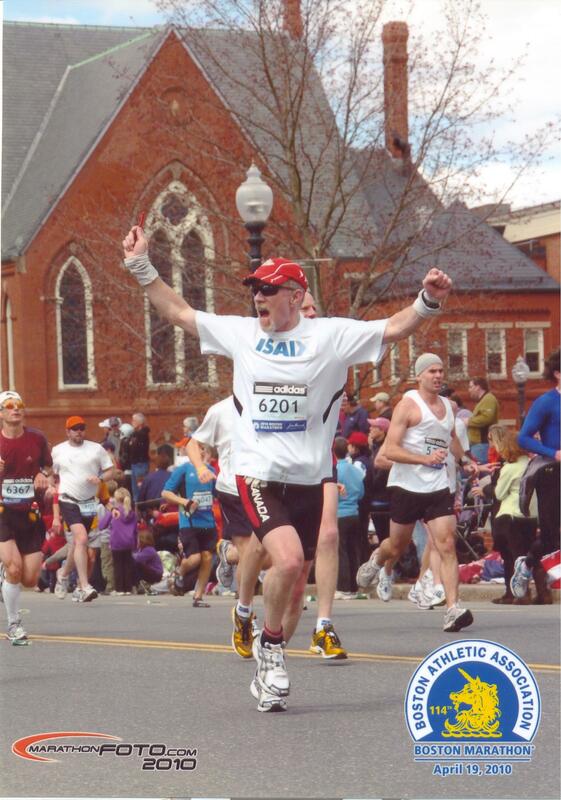 I kept training and in 1991 I qualified for the ultimate of all races, the Boston Marathon. It’s an event many distance runners spend years aspiring to, and one I’ll always feel humbled and grateful to participate in. Tim running in the Boston Marathon solo in 2010. But after more than two decades of marathons, and eventually triathlons, I began to feel like I should be doing something to give back to the community of runners that had such a profound impact on my life. I didn’t know exactly what that meant, but I had been running for a quarter of a century, injury-free, and wanted to give other athletes the chance to experience what I had. Ron Hackett was blinded as a child in a car accident when a drunk driver hit the car he was riding in. He was only 11 years-old, but hasn’t let this loss prevent him from living an extraordinary life. He’s run more than 10 marathons and even a few triathlons – one of which, I guided him through — and even a five-day, 250-kilometer run through the scorching Sahara Desert in 2009. I didn’t meet Ron for the first time until after the evening before our first marathon in 2010. Without any formal training, we struck out for a jog around his neighborhood, Ron holding on to my elbow. We practiced running shoulder to shoulder, timing our strides so that our inside legs moved in sync. To be honest, I had no idea what I was doing, but he had run in that neighborhood for so long, he was almost guiding me. As we would approach a street, he’d tell me to “turn left here” or “turn right here.” He knew exactly where we were. 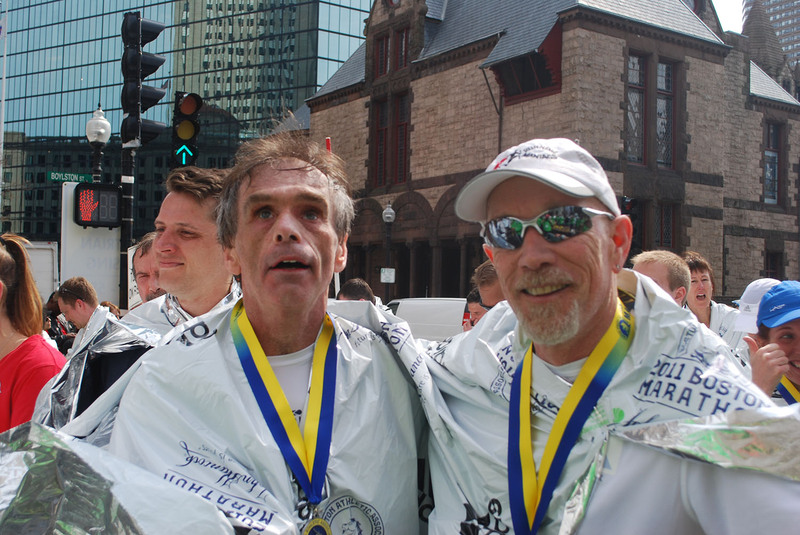 Caption: Ron and Tim after running the Boston Marathon together for the first time in 2011. As we were waiting for the race to begin that next morning, my nerves pulsed. There is always chaos when the starter pistol sounds; everyone is battling to get out in front, weaving through the crowd in hope they don’t smack into someone. Getting through those first several minutes without tripping or banging in to other people is a tough task solo, and now I had another person to worry about maneuvering through the madness. I was scared something would go wrong, but as we got through the first kilometer, I relaxed and we found a comfortable rhythm. A side effect of being attached to someone at the elbow for 42 kilometers is that you have the chance to learn a lot about each other. As we chatted during that first race, I knew Ron would be one of the most special people I’d ever meet. He’s a dedicated athlete. He’s a drummer in a rock band. And before moving in with his partner, Karen, he lived alone for years, cooking, cleaning and shoveling snow unassisted. I hadn’t known a blind person before Ron, and I had no idea that this level of independence was possible, and I have a deep level of respect for him. 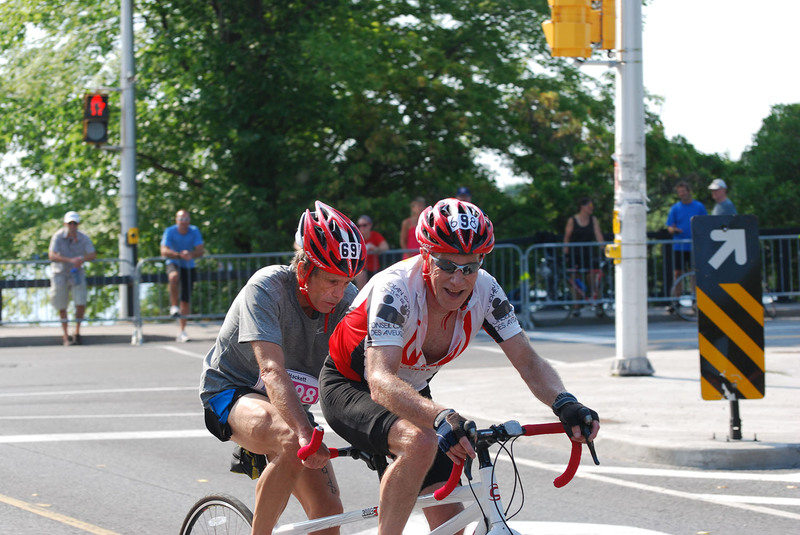 CAPTION: Ron and Tim during the cycling portion of the Ottawa Dualthon in 2012. In the past three years, Ron and I have run 10 races together and have become great friends. It’s amazing to think that because of one Facebook post, I’m connected with an organization dedicated to empowering visually impaired athletes and have met so many truly amazing people through my involvement there. Watching a blind runner cross a finish line, you can see that sense of accomplishment washing over them. That’s what this experience is all about, giving other athletes like Ron the opportunity to accomplish something extraordinary and help them feel included in society through the act of participating on an equal footing. Like in some other aspects of life, they aren’t being isolated or given special treatment. They’re out there on the pavement, just like everyone else. That’s what I’ve learned: If you don’t treat them like they’re handicapped, people will live life just like anyone else. This essay was produced in collaboration with Facebook Stories. To submit your own Facebook story, visit www.facebookstories.com, or click here. Tim Scapillato and Ron Hackett are running the Boston Marathon today as partners for the third time. You can read more about the organization that connected them on Facebook, Won With On by Liking its page. Think any others should’ve been in our recap? Head to Twitter using #OMGNews to chat about it!